One of the most attractive of all of the Echeveria Varieties is Echeveria agavoides ‘Romeo’. A beautiful rosette forming variety, the leaves will turn a brilliant red under the right conditions. This is a sport of Echeveria agavoides ‘Corderoyi’ and the foliage may be a green, grey, purple sometimes, with the red being at its strongest on the margins of the leaves. However, with the right amount of moisture and warmth, that brilliant red will shine through on larger portions of the leaves. This is one of those succulents that is beautiful, however difficult to grow. The main problem is with humidity, at the first sign of humidity it can decide that its time is up, and thats the end of the plant. This is one reason why it is expensive, and also why it is not as widely grown by home gardeners. If you want to grow this variety try these tips we gleaned from James Lucas from Succulents Australia. Use a growing medium very free draining, and one that does not contain much, or any, pine bark, as this can retain moisture, raise humidity and therefore increase the risk of fungal growth. To us these are the key issues. Keep humidity to a minimum, use a fan to increase the air flow if humidity is high. Instead of watering normally, try a soaking the plant in rainwater for 15 minutes and then allowing it drain thoroughly. Also make sure that the growing medium is next to dry before watering, not just the surface, but right through the pot. Poke your finger into the drainage hole to make sure that the roots are dry. Echeveria are hungry plants, the difficult ones that tend to rot in humid conditions as even less so. So use a low nitrogen fertiliser at 1/3 the normal application rate. 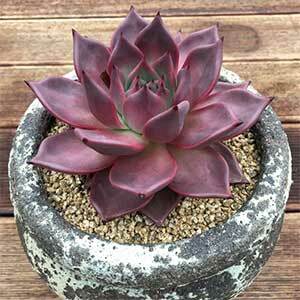 Common Name – Echeveria ‘Romeo’ also sold as ‘Red Ebony’ and’Taurus’. Soil – Well drained succulent mix.